A guardrail is intended to catch a vehicle that is headed in the wrong direction, i.e., off the road, and guide it back onto the road with as little damage to the vehicle as possible, all to reduce the risk of personal injury inside the vehicle. But what happens if a kerb is installed in front of the guardrail? Pursuant to European standard EN1317, guardrails are currently subject to compulsory crash testing, and must be CE marked to ensure that they function properly. When the guardrail is later used on a road, it is obviously important that it be installed correctly, in the same configuration in which it was tested. Failure to do so may compromise the function of the guardrail. Guardrails are not tested with a kerb in front of them. Most guardrails are based on the principle that the guardrail posts will be deformed and yield from the ground level and up to the transverse rail, so that the railing, cable or pipe profile can form a soft curve and guide the vehicle back onto the roadway. Each disruption of this system entails a technical risk that reduces the protective capacity of the guardrail. But what happens if a kerb is installed in front of the guardrail? And why have people begun installing kerbs in front of guardrails? The most likely reason in urban areas is a desire to guide storm water toward storm drains: the kerbs frame the road and thus guide the water to the storm drains. This may benefit the environment, but has any thought been given to the function of the guardrails in the event of a collision? A desire may also exist to protect guardrails from snowplough damage, as the presence of a kerb will reduce the risk of a snowplough reaching the guardrail. Do kerbs alter vehicle behaviour? We wanted to investigate whether having a kerb in front of a guardrail is consistent with proper guardrail function. 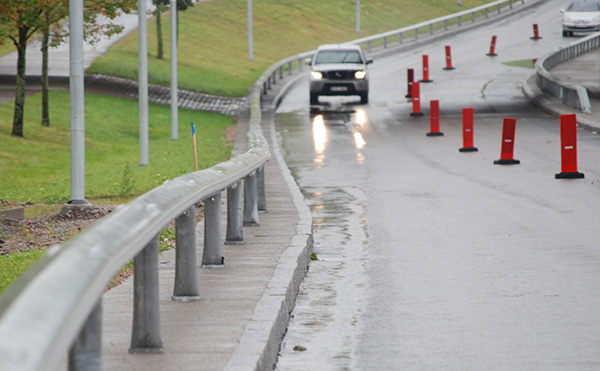 With a kerb in place, the portion of the vertical guardrail post that can be deformed and curved on impact becomes shorter, so that the guardrail will likely be more rigid than when it was tested. The fear in that case is that the guardrail will not function at all, or that vehicles may hop the guardrail. In addition, the vehicle wheels would bounce up over the kerb, creating a different impact scenario between guardrail and vehicle than in the approval testing. A third factor to bear in mind is that the kerb could cause the vehicle to start to overturn in the direction of the guardrail before reaching it. This would be particularly destructive for two-wheeled vehicles, i.e., mopeds, bicycles and motorcycles. 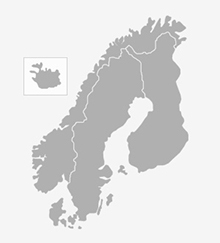 Together with the Swedish Transport Administration, which financed the project, VTI and the crash-test course decided to test such an installation. In our view, such installations are improper if we compare them with the test situation as per EN 1317 and in relation to other crash tests involving a guardrail of the EU4 type. We wanted to test the hypothesis that the vehicle is at risk of hopping the guardrail or being negatively affected by the kerb in some other way. We consequently installed a 15-cm-high granite kerb roughly 48 cm in front of the traffic side of the guardrail. The guardrail was positioned so that the middle of the rail was 55 cm above the roadway. We drove a Volvo loaded to a weight of 1,500 kg at a 20° angle, precisely as is customary when testing guardrails in accordance with EN1317-2:2010. However, there was one deviation: we chose speeds different from those prescribed by EN1317. One normally drives into the guardrail at a speed of 110 km/h, but our assessment was that the risk of a car bouncing over the kerb was greater at a lower speed. Speeds of 45 and 90 km/h were therefore chosen, and two tests were carried out. Research must be open to new and unexpected results, even outcomes that one would not believe could occur. Our hypothesis was that the car would bounce and behave poorly, perhaps even going over the guardrail. But our hypothesis was proven wrong. The car’s suspension and pneumatic tyres easily compensated for the movements that occurred as the front wheel went over the kerb, although the wheel and rim did sustain damage. It is also important to note that this is a good research result, even though it is not the one we had expected. We learned something new, i.e., that cars can drive over a kerb in front of a guardrail without much harm. Certainly, there may still be a degree of risk for two-wheeled vehicles riding over kerbs and overturning in the direction of the guardrail, particularly as we have not yet tested that scenario. It is also true that guardrails are not normally tested with a kerb in front of them, and their function cannot be guaranteed with complete certainty when the installation is non-standard. Be that as it may, we could not prove with these two tests that there is any risk inherent in placing a kerb in front of the guardrail, at least not with this particular vehicle, this particular kerb design and this particular guardrail. Perhaps something else may hold true for other combinations. We consequently decided, in consultation with the Swedish Transport Administration, not to continue with more tests; we considered that we had learned enough about the case involving the combination of a kerb in front of a guardrail, and that this configuration posed no immediate increased risk of improper function. The project has thus been concluded. But questions still remain, despite these tests. Examples can be seen in these two pictures. The guardrails in the two pictures above are of the same type, but installed in two different ways. Each guardrail has a creased knee on its posts, a knee intended to become deformed under the effects of a collision. The knee in the left-hand picture is situated above the surface of the traffic island, and is likely still functional. The knee in the right-hand picture has been cast beneath the surface of the concrete and is concealed by paving setts on the actual traffic island/sidewalk/cycle path behind the kerb. The type-tested function of the guardrail is likely disturbed, and the possibility that the kerb may affect the function of the guardrail cannot be ruled out in this case. This entry was posted in Infrastructure, Safety and tagged guardrail, kerbs, traffic safety, VTI. Bookmark the permalink.